It was so long ago that I think it involved a stone tablet, hammer and chisel. LOL. I do, however, remember writing a short story for my girls when they were little entitled ‘Betty & Bumper Go Adventuring’. I printed it out, drew pictures for it and stapled its ‘spine’ together. I think one of the girls may still have it somewhere. I have always written for my own entertainment and spent the last ten years writing characters and telling their stories with others in various collaborative roleplaying communities themed around the world of Anne McCaffrey’s Dragonriders of Pern book series. I also participated in NaNo in both 2012 and 2014. It wasn’t until the April Camp Nano in 2016 (during which the first 50k words of Resurgence were written) that I began to dream about the idea of turning my storytelling passion into a profession. My family and a couple of close friends. I know, that sounds so cliched. But were it not for their encouragement and support, I would never have had the courage to submit Resurgence in the first place. I must give my mom extra kudos for the hours and hours that she patiently listened to me blathering on about my characters like they were real people. She is still my number one sounding board when I need to brainstorm a plot twist or when I’m having a crisis of word flow. Do you exclusively write paranormal romance or have you written in other genres? As an adult with ADD, maintaining any kind of balance and/or focus can be a challenge at times. This is where my passion for music comes in and helps to centre me during writing sessions. I am also truly grateful to be able to say that writing is my work. While I also design patterns for crochet toys and sell those through my Etsy shop on the side, I am determined to turn my writing passion into a sustainable career. Scary, nerve-wracking but altogether exciting too! Resurgence took me four months to write, Renegade, five months – longer if you count the break I took when I began writing the MC Contemp Romance I have yet to finish. I’m hoping to get book 3 out in four and a half months. Since I’m a pantster and revel in discovery writing, I tend to research as I go. Again, it does make for a bit of a stop-start approach but so far, it’s worked for me. That is, if you discount falling down rabbit holes that began with Googling: How long does it take to dig a grave by hand? And somehow ends with: Watching a Facebook video of someone making a three flavour swiss roll. I can’t even claim that I then went on to make said swiss roll for the family. LOL. Welcome. You have activated all systems. Deactivation is not an option. You must find the truth. Remember, not everything is what it seems. If you don’t stand for something, you might fall for anything. The end is where we begin. I have! Aside from visiting the local graveyard where Ross, Apollo, Ares and Keanu have their little showdown in Resurgence, my #HEA surprised me with a trip to Underberg in the Drakensberg mountains to the exact location that has inspired the compound that Eros and the resistance take over at the end of Resurgence. It was amazing! There is an old abandoned hospital that inspired the one in Renegade (book 2) that’s just down the road from where I live. However, since it’s listed as one of the top ten most haunted places in South Africa I am way too chicken to check it out myself 😉 There I cheated and relied heavily on Youtube videos taken inside the dilapidated buildings by paranormal investigators and Google Earth for a 3D external view. 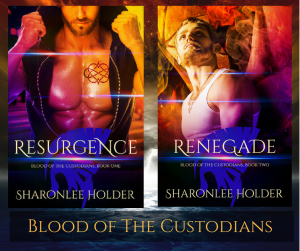 I’ll be sharing some of those links on my blog and Facebook in the weeks leading up to Renegade’s release. With my #HEA being a patched member of the Hell Razors bike club, inspiration for my unfinished contemporary MC romance is taken directly from my and his involvement in the biker club life. The inspiration for Blood of The Custodians grew from a series of What Ifs after watching the delicious Henry Cavill in the 2011 movie, Immortals – What if the gods of Greek and Roman times still lived among us? What would they look like? What would their politics be? How would they integrate with us and what have they been up to for the past one thousand years? Paranormal romance all the way with a brief tour here and there through high or urban fantasy as well as historical fiction as written by the incredible Ken Follet. 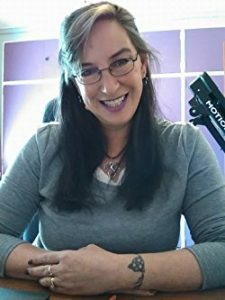 When it comes to PNR, I will admit to having a mega fangirl crush on JR Ward, author of the Black Dagger Brotherhood series and would probably swoon dead away if ever I got to meet her. Ward writes PNR and vampires like no one I’ve ever read before – Edgy, fast-paced, steal-your-breath away, melt-your-bones stuff. Karen Marie Moning, author of the Fever series is a close second – Jericho Barrons is delicious! When it comes to contemporary romance, Lori Foster’s Men Who Walk the Edge of Honor is my all-time favourite series from her so far. In this series, Foster writes the perfect blend of hot alpha males working as white hat mercenaries with steamy romance all while dealing with the grim reality of the modern-day slave trade. Haha. Yes. Yes, I do 😉 There is a scene in Resurgence where Antara encounters Tryston (The Dark Hunter) for the first time that was inspired by a recurring nightmare I used to have as a teenager living at the coast. In Renegade, there is a scene set in Chicago that briefly touches on a strange little house squished between two modern hotels. Back in March of 2013, during a trip to the States, I stood outside in the middle of a snowstorm opposite the real-life inspiration and told my #HEA that one day, I would write a book and put that little double-storey house in it. Total squee moment when finally, I got to do just that! I only wish I could have written more about it. Oh, this could get me into trouble. LOL. One or two of my characters are certainly drawn from real-life inspiration. For instance, Hailey, Antara’s BFF, is a composite of the close friend of one of my daughters and a friend of mine from the Hell Razors all wrapped up in the bounce and charm of a Jack Russell 😉 The real-life sources of Hailey’s inspiration are aware of this. Except the Jack Russell who was more interested in chasing imaginary squirrels than hearing how she had inspired a character. Gladiatrix by Russell Whitfield. I received the first book as a gift from a dear friend back in 2011 and loved reading about Lysandra, a Spartan warrior priestess who fights her way from shipwrecked slave to fearsome victor in the gladiatorial arena facing many deadly foes and circumstances along the way. Wheels Up (Out of Uniform) by Annabeth Albert. A m/m military romance I thoroughly enjoyed Annabeth’s exploration of the psychology and dangers involved when a pair of new lovers suddenly find themselves thrust into the forbidden territory of a relationship between a commanding officer and enlisted man due to an unforseen transfer. What an emotional rollercoaster! And…hot, hot, hot! Haha. Haven’t we all? My results are pretty boring though. It’s all book/author stuff and the various crochet and cross stitch patterns I’ve designed for magazines or that I sell on my Etsy shop. Putting down more words in a day that by the end of it, will survive my daily edits. My greatest aspiration is to be able to achieve a steady flow of between 3,000 and 4,000 words a day that make it passed edits. Read. Read, read, read! And I don’t just mean novels in the genre you want to write in but everything about the craft of writing and publishing that you can get your hands on! Sign up for newsletters that offer free advice, read articles by other authors, editors and publishers. Follow published authors, editors, agents and publishers on social media as they not only have sage advice to give but will often share articles on all things related to the craft of writing. Things such as the difference between ‘showing’ and ‘telling’, character growth, plot development, query letters, writing a synopsis etc. Angela Ackerman on twitter is a brilliant place to start. She’s always sharing amazing tips and hints. Social media! That’s two. #mybad. Seriously though, get on social media, follow other authors, book reviewers, bloggers, like their posts, share their stuff, retweet. Reach out. ENGAGE! It’s not just about marketing your book. You need to network and build relationships too. While I’m not as good about blogging as I should be, I do like to reach out one-on-one and share what I’ve learned in terms of what’s worked for me and what hasn’t, what info is out there for the taking and where to find it. I know how lonely and overwhelming the journey can be and how much just even the smallest bit of encouragement can help. 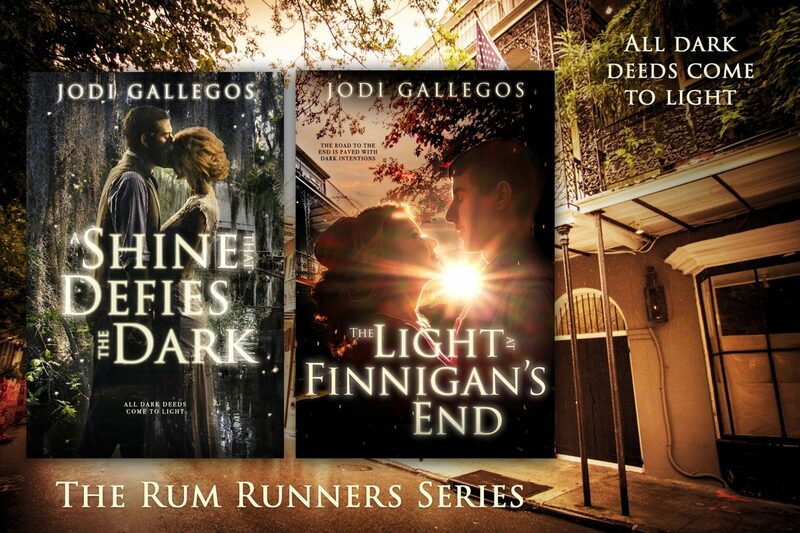 Set in modern day urban South Africa, Resurgence is a fast-paced paranormal romance featuring rich, dynamic characters centered on a smoldering love story and timeless themes. One Liner: Love has the power to move gods. One Liner: He’ll risk his heart to save her soul.